I should start by saying I’m pretty excited that we’ll be getting a two-way protected bikeway along Stanley St from Ipswich Road, in to the Goodwill Bridge. I’ve written about this in part 1, part 2, and part 3 of my review, and overall I think the designs are great. However in this post I want to talk about the intersection of Stanley St and Annerley Rd which is the aspect of the design of the Woolloongabba Bikeway that I don’t like. At all. For context: I ride inbound on Stanley St almost every morning, and also pick my way through here along the footpath in the evenings a couple of times a week. I certainly won’t miss the drivers who regularly risk my life by trying to turn left from Stanley St into Annerley Road without noticing that I’m riding along the bike lane just ahead of them. And of course like everyone else who walks and rides past her ghost bike, I’m very aware that this is the spot where Rebekka Meyer was killed under the wheels of a truck and trailer 3 years ago. 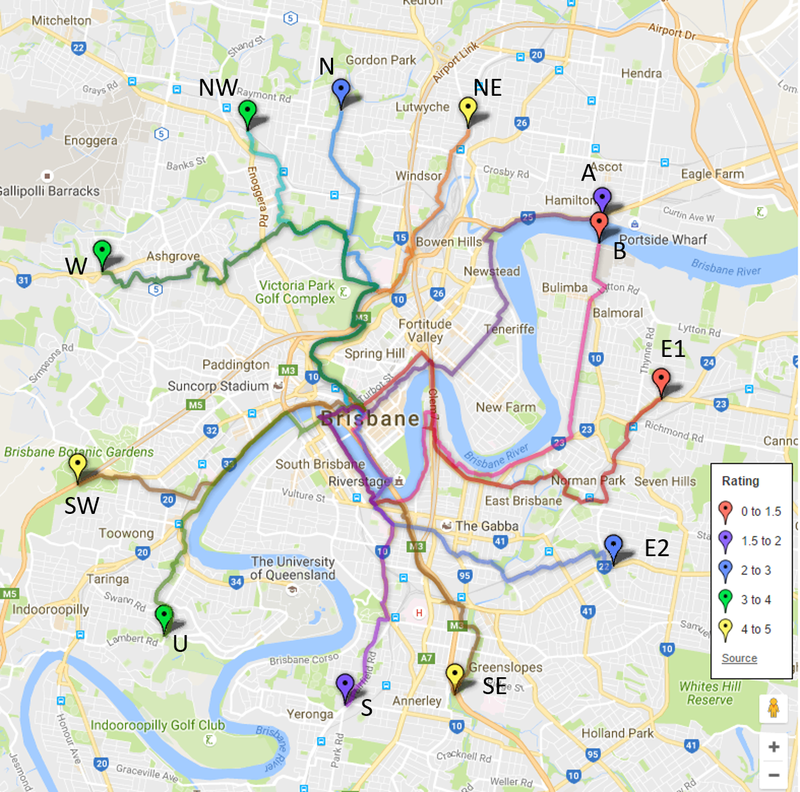 As the Queensland Coroner reminded us in relation to that incident, protected cycling infrastructure in Brisbane is long overdue. I’ve already written about the Stanley St and Annerley Road intersection when the reference design was released earlier this year, and I’m no more impressed than I was previously that Council have decided the only way to provide a pedestrian and bike crossing on the western side of the intersection is to remove the one on the east. I’m afraid I simply don’t believe the argument that geometry precludes a crossing on each side, because somehow the turning circle for a truck or bus wouldn’t fit. I see this decision as evidence of determination not to “hold up” motor vehicle traffic at all costs. Because somehow the time that a person spends protected from the weather in their air-conditioned car is more valuable that the time spent by people standing in the sun or the rain waiting to cross the road. If we’re serious about enticing more people to use public and active transport instead of private cars, then this priority is simply wrong. The intersection configuration the project team seem to have settled will require people travelling along Stanley St by bike in either direction and at any time of day to queue and wait for two awkward crossings to simply cross from one side of the street to the other. Worse, I can see this creating all sorts of conflict between cyclists and pedestrians, as there simply isn’t room for everyone to turn, stop and queue to get where they want to go. I can’t see that the space available will even cater for current demand, let alone for future two-wheeled and foot traffic. You can already see this play out every morning at the corner of Vulture St and Graham St, where people waiting to walk across the road will more often than not queue in front of the green-painted bike crossing, while people arriving by bike can’t turn to face the direction they need to go without blocking other pedestrians and cyclists from getting off the road. And in that location there is plenty of room to manouvre a bike, which will not be the case at the Stanley/Annerley corner. Add a cargo bike or trailer to the mix, not to mention a couple of people prams or wheelchairs (it is out the front of a major hospital after all), and we will be left with simmering frustration and real danger that someone will be clipped by a vehicle because they can’t get clear of the road in time. As suggested by one of our supporters on Facebook, if Council insist they can only provide crossings on 2 of the 3 arms of the intersection, lose the one the southern side, and provide crossings on the east and west. This would be awkward for people wanting to turn left from Stanley St to Annerley Rd, but there are less people taking that route, and those who wish to still have the option of using Merton Road and Catherine St to by-pass the intersection altogether. As I suggested in part 2 of this review, move the eastern crossing point further to the east, away from the intersection, and combine it with the pedestrian crossing already at that location near Allen St. Suggestion “2” is concise, eastbound cyclists might otherwise be tempted to mix it up in traffic to make that connection cleanly. The sharp turn at it joins the other side of the road is no worse than the other options and could be tidied up but leaves a pedestrian/bicycle conflict as they cross each others paths, so making it a two stage with an unrushed mixing time off the road makes a lot of sense.